This is an IELTS listening exercise which I have made for my Vietnamese students about their wonderful New Year’s celebration called Tết. It is a sentence completion practice so you will need to fill in the gaps as you listen. Remember to read the questions before listening to the audio. Answers do come in order. Complete the sentences using no more than three words. Another name for Tết is ………………. One typical dish at this time is a soup which is made from ………………..
Before Tết, people buy ……….. trees and ………. blossom to adorn their house. ………… the house is forbidden during Tết. Tết is celebrated on the same day as Chinese New Year, though exceptions arise due to the one-hour time difference between Hanoi and Beijing. It takes place from the first day of the first month of the Vietnamese calendar (around late January or early February) until at least the third day. Vietnamese people consider Tết to be the first day of spring and the festival is often called spring festival. Many Vietnamese prepare for Tết by cooking special holiday foods and cleaning the house. These foods include square rice cake, Vietnamese sausage, dried young bamboo soup, sticky rice and boiled chicken. There are a lot of customs practiced during Tết, such as visiting a person’s house on the first day of the new year, ancestral worship, wishing New Year’s greetings and giving lucky money to children and elderly people. There are certain things to observe during Tết and certain things to avoid. Houses are thoroughly cleaned in preparation for Tết. 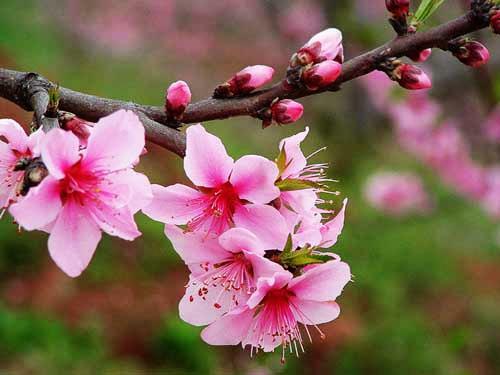 People buy kumquat trees and peach blossom to decorate their houses. There are dragon or lion dances in the streets. New clothes should be bought for every member of the family. And on New Year’s Eve, the kitchen god, Ong Tao, is welcomed back to the kitchen. On the other hand, somethings must be avoided. Sweeping during Tết is taboo and considered to be unlucky, since it symbolizes sweeping away the luck; that is why they clean before the new year. It is also taboo for anyone who experienced a recent loss of a family member to visit anyone else during Tết. 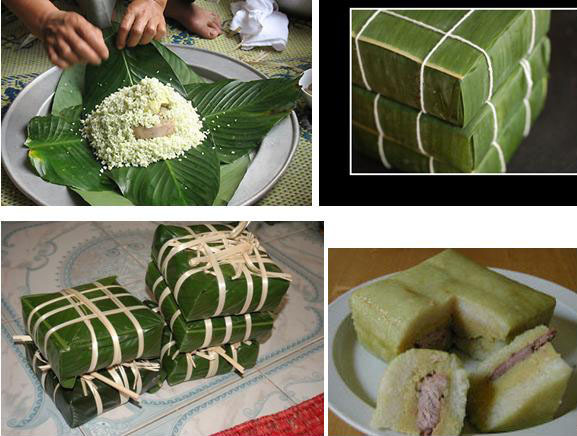 square cake (bánh chưng) = A cake which is made from sticky rice, mung bean and pork wrapped in leaves. 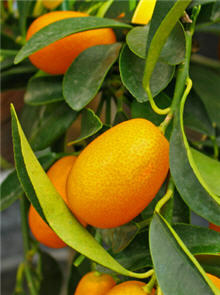 kumquat = A small citrus fruit similar to an orange. Both peel and flesh is eaten. If you would like me to make a lesson about a festival or part of your culture, please let me know the details by posting a comment in the box below. Regards, Liz. you are providing enough questions and answers with good video presentation. I like this website and You Tube videos that you are uploaded. Thanks for your support especially for this resources. In this test you mentioned that capital letters are not needed, but you have always recommended writing ALL answers in capital letters in both reading and listening. Am really confused now. It means you don’t need to start that particular word with a capital – it relates to that one question because the word is at the start of the sentences. Yes, it is best to use ALL CAPITAL LETTERS. You have written ‘ children and elderly people ‘ as an Answer. Children and elderly people in answer sheet. I did not use the word “and”. You don’t need to use a capital letter. ‘children’ goes into the first block and ‘elderly people’ into the second. btw, your question can be phrased better as: Is it the correct way to write it or can we write. I’m from Kerala, which is a southern state in India. We celebrate Onam every year and consider this as one of the most popular festival in our place. If possible, please provide a lesson on “Onam Festival”. We will be happy to see it. Thanks for your excellent teaching Skills and subtle way of promoting different cultures. Hi Liz ! Thank you very much your website is very informative and useful. Correct spelling is essential in listening and reading – as well as writing. That was a difficult word. Most tests will be easier. Here u told us that the answers do come in order so will that happen in real ielts exam???? How we will know that the answers of any specific section will come in order???? I have written those instructions for this listening exercise. They are not instructions for the whole IELTS listening test. In the listening test, answer will come in the order of the question numbers. How much time we typically have to read a set of questions before listening the audio? Do we get 0.5 mark where the answer is partially correct ? Like in question 4, I got “kumquat” wrong but “blossom” was correct. There are no half points for getting half an answer right. I wasn’t aware that we could also get words with difficult spellings in Listening (like the one in this exercise “kumquat”.) I thought difficult words in Listening would be spelled out in the audio. When I heard, I thought that the hell is that tree. I can’t imagine any native speaker asking for this fruit in a shop and spelling the word. IELTS will only spell words or names if the context calls for it. The recordings are somehow not playing from the Vietnamese new year onwards. Was wondering if there is a problem with the recording or some local issue at my end. Is writing comma between answers like Kamquet , Peach is right or is it considered wrong?please please reply me…Thank you.! It doesn’t affect your score. Personally, I wouldn’t use it – it isn’t needed if the two words are written clearly. Ganesh Chaturthi, a festival celebrated by Hindus in India. You can get the complete details by searching Ganesh Chaturthi in Wikipedia. The IELTS Cambridge books are real tests published by IELTS. They are exactly the same as the test you will take. The time given to read the questions is the same. Your aim is not to read in depth, but to read and quickly underline key words. “Kumquat” should have been spelled or atleast repeated in the Test…. Not all words are spelled. If I were asking for this in a shop, I would not spell it. This is a fruit and any native speaker would know how to spell it. Names of people can vary which is why they are sometimes spelled. I have never heard this word before…. Shouldn’t “kumquat” start with a capital letter since it’s a name of a plant ? I got 1, 3 and 5. I heard olderly instead of elderly. so if i write olderly would be correct anyway? Unfortunately, it would be marked wrong. Many thanks for your nice listening practice on Vietnamese culture. However, we do not play lion or dragon dance in streets in traditional Tet holidays. Maybe this is Chinese customs. Additionally, we play lion and dragon dance presentation in Mid-Autumn festival which is a special festival for children. Do you believe that the presentations usually take place in evenings for 15 days from 1st of Lunar August to 15th of Lunar August? Of course, children love the festival very much. Dear Chinh, Lion Dance is very popular in Hochiminh, especially from 1th to 15th Lunar January, when most of companies invite Lion to come for their opening ceremony in the beginning of the year. Thank you for this special topic, although I still do not have chance to hear it as the firewall of the company’s laptop. Wishing you and your Family a Prosperous, Healthy and very Happy Rooster Year! Can I just write dried bamboo in question 2 ? It is a possible answer. It was excellent information about the Vietnamese celebration and their traditional practices. The people, like me, who are interested in observing different cultures and practices, love this session a lot. I want to add something, there is a similar festival in the South of India (named Vishu) celebrated by the Hindus. This celebration also includes sharing lucky money, visiting relatives, preparing special dishes and home preparations in exactly the similar as Vietnamese practice. This also earmarks the beginning of new year in local (Kerala) calendar ( Malayalam Language Calendar). pls note the change : This celebration also includes sharing lucky money,visiting relatives, preparing special dishes and arranging the home in exactly the same way as the Vietnamese practice. Thanks for sharing 🙂 Vishu looks an interesting festival. Hi Liz, I started learning English from your blog days ago. I’m really appreciated your effort to help the others to improve their English, the key to be successful in the future. Especially, reading this topic and comments, my blood is going faster and faster as I’m Vietnamese, I got your beautiful thought about our culture, about Tet. I’d like to thank you, thank you very much Liz. would only ‘dried bamboo’ be considered right? Oh… 4th one was tough..I did not know about that fruit.. Yes, that was really hard. Probably only for band score 9 students so don’t worry if you missed it. What if we only write peach/kumquat? I mean what if we score half of the mark????? There are no half marks. You either get the whole answer right or it’s wrong. Yes, I understand your concerns. I appreciate your effort to help others. Anyway disabling the context menu isn’t the answer for protecting the content. The content of this page can be stripped in a minute or two hehehe! Hope it will put people off from attempting to copy what is protected by law. I know Vietnamese people are not accustomed to respecting copy right but other nationalities are. Particularly, when it is from someone who works 7 days a week for free offering help and advice for free. I hope you also will respect that. I have a logically sound question. “Chinese New Year”, all words start with a capital letter. Vietnamese people call Tet as spring festival. That’s what they call it. So why is it wrong to capitalize the letters of spring festival as “Spring Festival”? This audio was not very clear and pronunciation of some words such as “kumquat” was not common and must be spelled but you didn’t instead you spelled very fast. English people don’t spell the names of fruit during a conversation or a talk. IELTS only spell names of people which are uncommon, no other words are spelled. This is a language test. It is testing your ability to know uncommon and common words. Band score 9 students will know “kumquat” other levels might not. This is part of the test. If I write “children,’elders” on question 3 is it still correct? No, it would be wrong. Thanks for sharing 🙂 It sounds lovely !! Remember that the word is “dish” not “cuisine” (prepare special dishes). Thanks Liz for pointing out this…! I was considering both as same. It is such a very useful website. Thanks for sharing your knowledge with us. I just have a question. If I write “Spring Festival” with capital letter, will it be a wrong answer? I would be considered right. Thnaks alot but I think number 4 should be spelled . In normal speech, we only spell out names of people or places. We never spell out fruit. No conversation or talk would do that. So, it will never happen in your IELTS speaking test. Although it is an unusual fruit, it is still a fruit that band score 9 students will know and be able to spell. madam for 2nd answer can we write “elder people ” for second blank ? No, unfortunately that would be wrong. I am gonna take the on 29th of this month. Your blog is helpful but the very audio was so fast to catch the answers up. Also I made spell mistakes of the tree type. I fear, I will lose marks. You do not need to get all questions right unless you are aiming for band score 9. So, it is natural there will be questions you can’t answer and words that you don’t hear clearly. Is it a “loss in a family” as the audio says? Or is it “loss of a family” as it’s stated in the text? Or is it the same? You can write “loss of a family member” or “loss in the family”. The word “member” is essential to note. 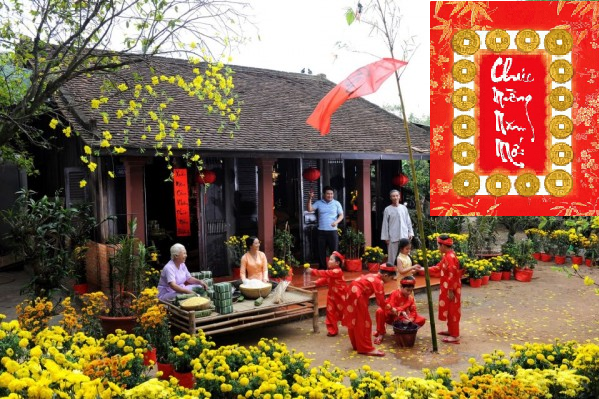 The way that the Vietnam people celebrate spring festival is really traditional and classic. In China, around 20 years back, we had the same things to do. The parents would prepare many different delicious foods for the whole month of festival. They started preparation early before the most important day for new year, which is eve, similar to the eve for Christmas. In common families, they cooked various foods such as fried dough, fried dough twist and even complicated one, also made from dough in shape of stem of umbrella tasting very well and crispy. That is for food. In addition there would be many different kinds of social activities which would be performed usually on the third day of new year. A group of people would dress up and wore in uniform. They prepared performance and show on the busiest area like downtown area and some big communities where you would observe all audiences were in new clothes with cheerful smile on their faces. Even in some places, they had the tradition of lion dance, which is still reserved at present in some Chinese-dominant places for example Taiwan and Hongkong, Singapore or even China town all over the world. Fantastic! Thanks so much for telling us about New Year in China. I have celebrated New Year in China a couple of times and it was wonderful. I have never seen fireworks as good as those at Chinese New Year. And the dumplings that I made with a family were delicious! Hi, Liz! Well, I’m from Vietnam and I have to say that what u wrote about VN is definitely correct and beautiful. I feel regret because I didn’t know you before when u were in Vn :(. I can use some these words in my speech. And now i know what bamboo soup is thanks to your talk. Thank you and God bless you, Liz! It’s been a month of learning using your excellent website. I used to approached each of your sample charts (bar, line, table, pie and diagram). Now, I’m on my way to learn the rest of the charts (flow chart and map). I’m from Philippines and I just found your website an hour ago, and your website very much helpful. Go through each section on the red navigation bar to learn more about IELTS and develop your skills. Hello Liz! Your lessons are very useful and I’m glad I found your website at the right time! Thank you very much! I had a little difficulty in spelling ‘kumquat’. I haven’t come across this word before and I suppose it’s not used very often. If that’s the case, will the spelling of the word be mentioned? No, spelling is mainly used for form completion in section 1 for names or places and also mainly in conversations. This is just a fruit and the listening is typical of section 2. Band score 9 students would know it. Don’t forget that if you are aiming for only band 7, there will be questions you can’t answer correctly. My correct answers are 4. I’m glad to know Vietnamese culture. Thanks, Liz!